It is the best of times for burger fans, but it is also the worst. No sooner had McDonald’s aficionados been promised a limited edition Grand Big Mac, it was snatched away from their hopeful, greasy little fingers. There has been a frenzied rush at McDonald’s by people longing to get their mouths around the supersized beef patties. Some fast food lovers have been running desperately from Maccy Ds to Maccy Ds, but to no avail. Their popularity was also their demise and many restaurants have completely sold out. Unfortunately we cannot sell any Grand Macs due to a national shortage. Our restaurants experienced higher than expected demand resulting in the burgers being sold out for a short period of time. Branches are expected to be restocked within 24 hours. Until then, Big Mac fiends will have to suffice with cello-taping two regular Big Macs together to soothe their ache. Happy GRAND Big Mac Day! ?I’m lovin’ it! 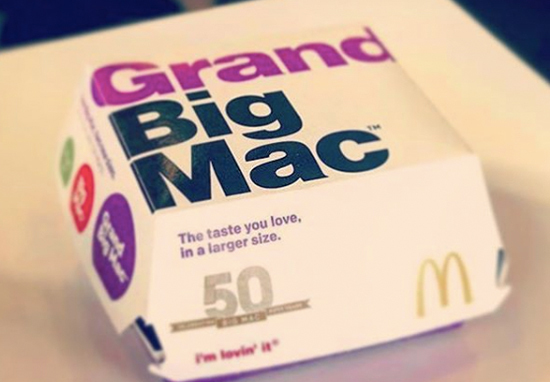 The Grand Big Mac will only be available until 20 March, as part of the 50th birthday celebrations for the iconic Big Mac. As an iconic McDonald’s product, we are proud and excited to be celebrating 50 years of the legendary Big Mac® and for the first time ever in the UK, introducing the two new sizes for a limited time. We know a lot of our customers will remember the 1974 launch of the Big Mac in the UK and have continued to enjoy the burger and pass the Big Mac® love on since then, it remains our most iconic burger! Let me just clarify. This is a HUGE burger which laughs menacingly in the face of other burgers which dare describe themselves as ‘Big Mac’. This is the Biggest Mac. Standing at an intimidating 4.5 inches tall, this will satisfy your filthiest junk food cravings and then some. Craving something big? Introducing the double cheesy, extra beefy Grand Big Mac™ for when that Big Mac® craving calls for something more. Sink into two larger 100% pure beef sandwiched between a sesame seed bun. All dressed with two times the special sauce, crisp lettuce, onions, pickles and two slices of American cheese.